Make a massive saving on this complete 14 piece re-gripping kit. Limited time offer - while stocks last! Now a tour classic the Black Widow Tour Silk has been re-designed and revamped, and includes a new surface pattern to optimise your performance and comfort. Black Widow addressed player demand for control, the re-designed grip allows golfers to focus on their technique and swing instead of their equipment. The Black Widow Tour Silk II provides the consistent feel and performance for golf activities from beginner swing development to professional shot shaping. This Black Widow Tour Silk II grip is built for all players in all weather conditions. Playable in all weather conditions. The Ultra Slim 1.0 has been updated with a sharp new colourway. The Legacy Series incorporates a stylish new colour scheme into the revolutionary range of putter grips that golfers have come to rely upon. This design of the SuperStroke Ultra Slim 1.0 Legacy Series is only 1.00” in diameter, compared to the 1.67” Fatso 5.0 and 1.30” Slim 3.0 designs. The SuperStroke Ultra Slim putter grip is 24% smaller than the SuperStroke Slim 3.0 putter grip. The Ultra Slim 1.0 provides players using standard sized putter grips an entry into the non tapered technology integrated within SuperStroke putting grips. This grip offers all the benefits of a SuperStroke grip without the oversized feel. 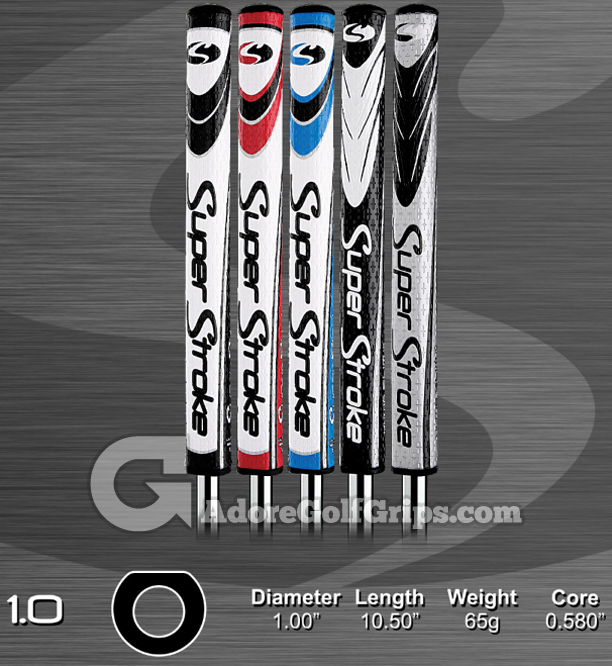 The SuperStroke Ultra Slim 1.0 putter grip has a profile of 1.00” diameter. With over 125 PGA Tour players having used SuperStroke grip technology, the patented putter grips help the world's best golfers play better every week. The proof; over $120 million in prize money won on tour. SuperStroke’s non taper technology allows for even pressure in both hands, eliminating added tension in the wrist and forearms. This helps the arms to swing free, further enhancing a pendulum putting stroke. The base layer of SuperStroke putter grips start with a rubber under listing and a new high tech PU material, featuring Cross Traction technology, for improved feel and tackiness. Excellent product to get started on re-gripping own clubs, excellent grips too.